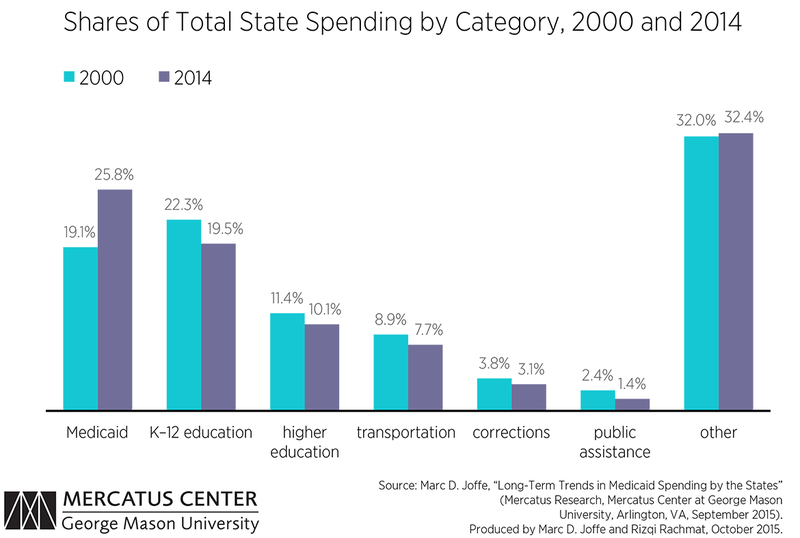 According to recent research, expanding state Medicaid spending is “crowding out” spending on other major state programs, most notably education and transportation infrastructure. This growth in state Medicaid spending, however, does not seem to be increasing state debt burdens. As the chart below shows, in 2000, state spending on Medicaid amounted to 19.1 percent of the total of state budgets. Education made up 22.3 percent, while transportation constituted 8.9 percent of state spending. Fourteen years later, in 2014, total state spending on Medicaid had increased to 25.8 percent of state budgets, while education fell to 19.5 percent and transportation spending declined to 7.7 percent of state budgets. The percentage of state spending nationwide devoted to Medicaid has increased as Medicaid enrollment and spending have grown, and other parts of the budget have decreased relative to Medicaid spending. Even as state budgets have increased over time, spending for Medicaid has grown faster, leaving relatively fewer resources for other areas that states might like to prioritize, such as schools and roads.